Kip Spencer is chairman of the board of governors at Washington Athletic Club in downtown Seattle. The Seattle skyline loomed large in the eyes of 4-year-old Kip Spencer. For years, his family made weekly trips from Port Angeles, and he watched as construction cranes sent skyscrapers soaring toward the heavens. He marveled at the big city’s towering columns and wondered who owned them and worked inside. 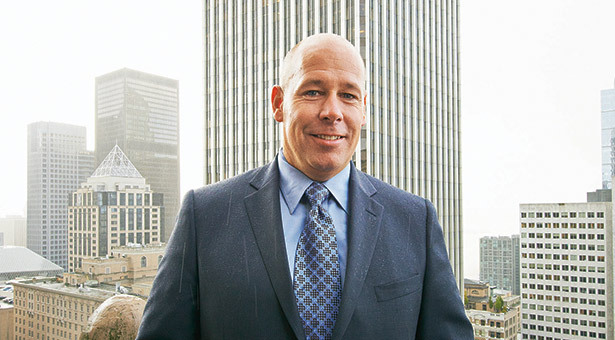 Now chairman of the board of governors at Seattle’s downtown Washington Athletic Club, Spencer, a 1989 Seattle Pacific University graduate, wants to connect SPU students with Seattle’s downtown business community. Attending Seattle Pacific taught Spencer how to develop both brick-and-mortar cityscapes and his own faith landscape. He “fell in love with the SPU campus,” a tranquil oasis of scholarship nestled in a bustling, urban environment. Majoring in urban studies, he learned to understand how spaces create a city’s heartbeat — performing arts centers, retail districts, business hubs, research institutions, and more. His love of cities was so well known that fellow classmates collected postcards of buildings for him during their travels, mementos he still treasures today. Spencer’s work in commercial real estate has only increased the value he puts on those urban spaces, because he’s seen how the right space can transform a business. Spencer says he benefited from many helping hands as an undergraduate. Joe Hope, dean of what was then SPU’s School of Business, introduced Spencer to the Washington Athletic Club courtesy of a breakfast meet-and-greet for students and business leaders. Spencer became a WAC member soon after graduation. Spencer recalls that his SPU classes were sometimes held boardroom-style around a conference table. However, it was SPU’s dedication to connecting the classroom and community that most influenced Spencer’s career. His senior marketing project on Seattle’s Two Union Square building won him notice and a post-graduation job with The Norman Company, a commercial real estate firm. He later co-founded OfficeSpace.com, an online commercial real-estate site, and is currently an executive vice president at Pacific Lighting Systems. He serves on the Executive Advisory Board for SPU’s School of Business, Government, and Economics. From the young boy looking upward at the city to the businessman looking forward to developing its character, Kip Spencer envisions SPU playing a central role. “The structure is in place right now to connect SPU and the business community to do great things,” says Spencer.